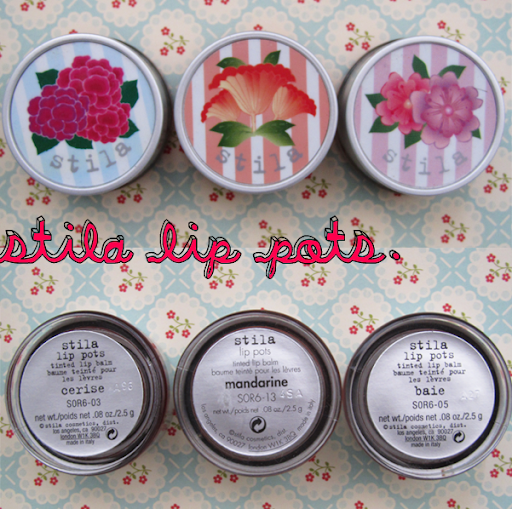 I bought these pretty Stila Lip Pots from sgDrugstore.com a really long while back. I'm not someone who's into lipsticks (Thank goodness! I can't be 'into' any more things! ), preferring to use lip balms, stains and glosses instead. 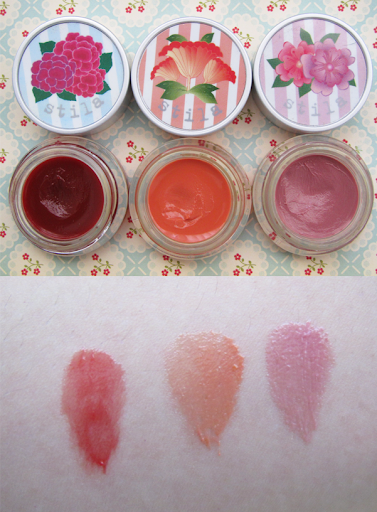 These 0.08oz pots are tinted lip balms. Undeniably, it was the vintage floral prints on the covers that caught my eye. Once I'm done with them, you can be sure that I'm going to clean them up and put them on display. Heh. Design aside, the pots are a tad heavy to be carried in the pockets. I usually stash my lip balms in my pockets for easy accessibility. But there is no way that I'm going to let these pots weigh my pockets and make me look like I have 2 extra growths on my sides! Also, the trouble with pots is that you have to stick your fingers in them. You can use a brush too but either way, it's more troublesome than the 'traditional' lip balms. Cerise is a rosebud red. It is like Benefit's Bentint Lip Balm, minus the very moisturizing factor that you get from the latter and SPF. These lip pots don't dry out the lips (They had better not!) but they aren't very moisturizing either. You'll see why when it comes to Mandarine. This is Mandarine, which is an orange/ bright peach. And look at how awful my lips look! I did apply a clear lip balm before layering Mandarine on. As I layered the balm on, it sort of 'latched' onto the dry areas and these dry areas clumped together as I rubbed the balm on.